well as my entire sidewalk, are covered with tiny dark specks. Doing a little research pointed me toward mold spores caused by wood mulch. That seems more likely due to the prevalence of it on the sidewalk, and it seems to be where I have the largest area that is mulched. It appears very difficult to remove also. So, if the problem is caused by the wood mulch, what might my option be? Or could it actually be flies? 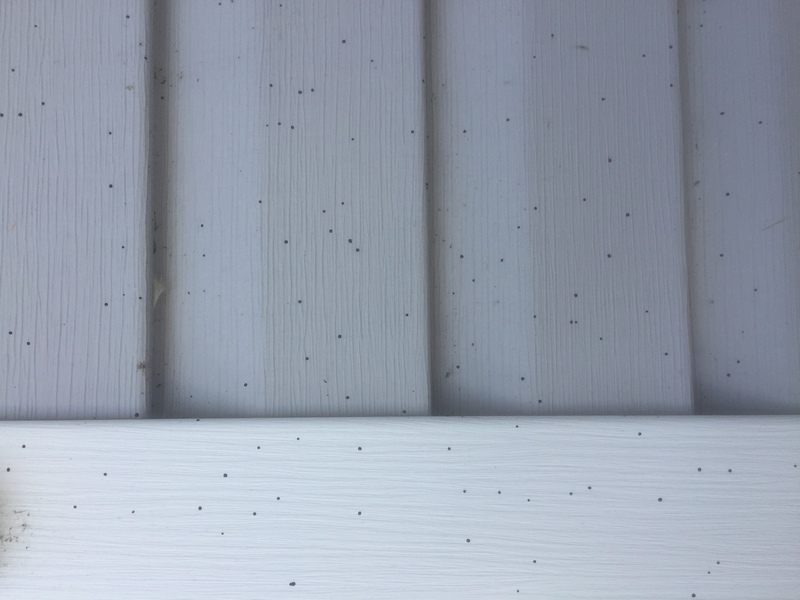 Doug: That’s artillery fungus, and it’s a pain to get off the siding. Let’s first talk about the fungus. You should rake out the mulch in favor of something like pine bark. Sometimes just adding a layer of mushroom manure on top of the mulch will do the trick, too. Here’s what readers Maureen and Dave Sagrati did to remove the spores. “We used Easy Off heavy duty oven cleaner. Sprayed it on and let it sit overnight. Then used Mr. Clean/Wal-Mart white cleaning eraser pads and lots and lots of elbow grease. It was a lot of hard work and scrubbing … my husband could only do a few slats of siding a day but it finally came off most of the siding. It was also on the caulking and window frames but that was much more difficult. We did what we could and painted the rest. Carol: I am wondering if I can dig up a heliotrope that has been in the ground all summer, pot it and keep it in the house over the winter months. If I can, should I cut it back first before potting? Doug: It can be done, but it won’t be happy growing on the windowsill over the winter. If you had some artificial light, the plant would be happier. There are lots of inexpensive options at nurseries these days. Michele: My euonymus has developed a rather bad case of crown gall. Is there anything I can do beside cutting it out? I will be very sorry to lose a whole hillside of euonymus. Doug: Crown gall can be a serious problem on euonymus, but the plant is tough. The best thing to do is prune out the galls, but sterilize the pruners between cuts. Use a 90/10 percent water/bleach solution. You don’t want to make things worse by spreading the disease to other parts of the plant. Next spring, give the area some organic granular fertilizer to make the plants happy and keep an eye on them, removing any galls you see. Peggy: I have two beautiful potted hibiscus filled with buds waiting to bloom. Any way of bringing these indoors to survive the winter? Doug: Sure, it’s a very common practice. When you bring them in, give them a couple of days in a “halfway house.” I use my sun porch, but it should be someplace you can keep them quarantined until you can be sure nothing is hatching out. Then just grow them over the winter by a bright window. They will look awful at first, but then bounce back. Start fertilizing in April and put them back out after all chance of frost has passed. You might even get some blooms indoors.